Not all publicity is good publicity -- and an Italian restaurant in Albuquerque, New Mexico serves as proof of that. 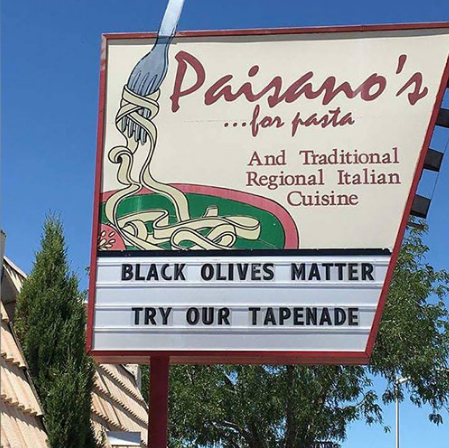 "We were trying to promote our pan-seared Ahi tuna with a black olive tapenade relish," said Paisano's owner Rick Camellia of a controversial billboard he recently put up in front of his restaurant. 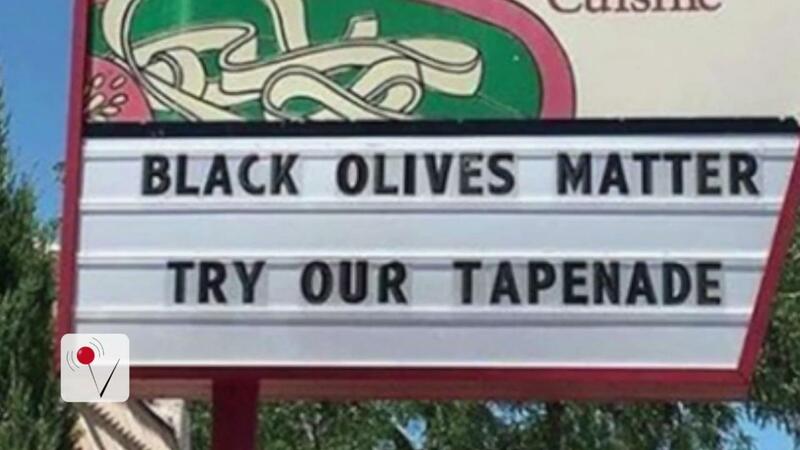 Oddly enough, we don't think the tapenade is what people are upset about here -- check out the slogan they chose to promote the dish with. "We put up what we thought was a cute play on words, which we do commonly here at the restaurant," Camuglia told KOB. But others, however, thought the sign was anything but cute. Given the nationwide controversy and tension surrounding police officers and their interactions with the black community, the billboard caused an uproar on social media and negative comments began to flood their Facebook page. "Disappointed in the blatant racism displayed by Paisano's," one woman wrote. "I don't care if the food is good or not, I will never set foot in this restaurant ever again." "Black Lives Matter is such a humble statement. A simple modest declaration of humanity," wrote another. "Why would you make fun of that? Why would you make fun of a people asking a country they built and love to show their lives matter?" Despite the flood of negative responses, the restaurant put out the following statement thanking those who vowed to continue supporting their business and the billboard. "A heartfelt "Thank You" to you from our Crew, some of whom were moved to tears because of your kind words and outpouring of support," the restaurant said on its Facebook page. "Many nowadays would contend that society has changed for the worse, but our experience this week has proven the opposite. We have encountered so many quality people of character; salt of the earth and the bedrock of America." Though Camuglia, who also received multiple upset phone calls about the billboard, told KRQE that the backlash was wholly unexpected, he eventually took the original sign down and replaced it with a much less offensive one. "We didn't think anybody would be offended by that," he said. "It was not our intent to offend anybody."